The Automotive Industry comprises of a wide range of establishments involved in the design, development, manufacturing, marketing, and selling of motor vehicles. The word Automotive was created from Greek and Latin words autos (self) and motivus (of motion), to symbolize any form of self-powered vehicle. Despite challenges, the automotive industry is at the vanguard of innovation. New initiatives are transmuting the industry to better reciprocate to the prospects of the current market. It is one of the world’s most significant economic sectors by revenue. There is an extensive network of industries providing services and machinery to the automotive industry to get their job done. 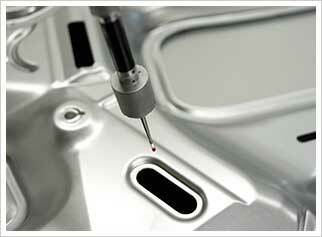 Noble Precision is one such place for all your automotive industrial needs. The automotive industry engages numerous techniques of machining for a variety of automobile components such as windscreen, outer body sheets, door panels, internal components, and assembly line manufacturing. The materials include both metal and plastic. One of the most widely used is CNC machine. It is a computer controlled machine that is used to cut metal/other material in a precise and accurate manner. It is indeed the most effective tool for high-end production. Noble Precision uses the advanced 5-axis CNC simultaneous machine and the latest in CAD/CAM software technology for Automotive Industry products and services. 5-axis machining involves using a CNC to move a workpiece or cutting tool along 5-different axes at the same time. This enables the machining of very complex parts with complete efficiency and accuracy. 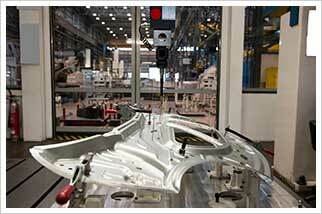 In the automotive industry, every facet of the manufacturing process demands high-performance. Change is the most constant thing in the Automotive Industry. And to be on the top and stay there, you need to be aware of the latest updates in the current market. You should have the best – whether they are components, molds, software, or the final product. Noble Precision has complete expertise in developing the simplest frameworks or the most complicated multi-cavity molds, which are capable of meeting some of the most difficult specifications. Fabrication/Welding is an important part of the manufacturing processes in the automotive industry. Cutting and assembling of parts are done with these processes. With the latest technology, skilled professionals, and a zeal to deliver the best, Noble Precision is proficient at handling and processing any welding/fabrication requirement of an automotive industry project. It may sound like a normal aspect of a manufacturing unit, but the process can be quite challenging. Noble Precision’s 5-axis CNC machines use hard stops to position cut parts in order to place bend lines correctly. The latest technology used here makes the 5-axis controlled press brakes seamless and efficient. Noble Precision’s quality and customized equipment are designed to meet even the most meticulous requirements. Beyond welding/fabrication services, Noble Precision integrates finishing of equipment and paint application process, resulting in ready-to-use parts for end users. All facets of the automotive assembly line – whether timing, quality, or quantity – require exact coordination. Mechanical assembly services foregather parts, components, equipment, and systems. Manufacturing doesn’t just end with the production of the end-product. The product also has to cater to the exact specification and requirements of the client and manufacturing ends only when the client is completely satisfied. Noble Precision’s machining, drilling, molding, fabricating, and assembling services are provided with the best of efforts resulting in accuracy and absoluteness. Every part produced is meticulously tested for its quality and precision. Checking fixtures is another name for inspection/evaluation. It is as important as manufacturing or producing a part or a component. With the use of 5-axis simultaneous CNC machines, the latest in CAD/CAM software technology, and skilled experts, Noble Precision’s quality assurance team never fails to deliver high-quality solutions. A stamping die is a precision tool used to cut and form a metal into the desired shape. Precision plays a crucial role in this aspect of the manufacturing process as the quality and tolerance of the end-products depend on the precision of the dye. Armed with state-of-the-art 5-axis simultaneous CNC machines and the latest in CAD/CAM software technology, Noble Precision can fulfill every stamping die requirement with utmost attention-to-detail to ensure that the end-product quality is perfect. Stamping dies are of 2 types and they perform two basic functions – Cutting, forming or both. There are two different kinds of stamping dies: Lines dies which ar either manually loaded or loaded using robots and progressive and transfer dies which are fully automated. Nobel precision with years of experience and expertise in designing and producing dies for metal stamping has the competence to cater to even the most demanding specifications and requirements. Noble Precision takes complete pride in having made a mark of its own in the market. It provides a wide range of manufacturing solutions for Automotive Industries from tools and dies to finishing and fabricating. Call the experienced tool and die manufacturers at Noble Precision today at 647-499-7569 or contact us to schedule a consultation on the services and support that we can provide.